If you’re having a water birth, you’ll need a tub or pool to deliver your baby in. While some women have the option to deliver at a birth centre, many women who choose to give birth in the water either need to use their tub at home, or rent or buy a special birthing pool. 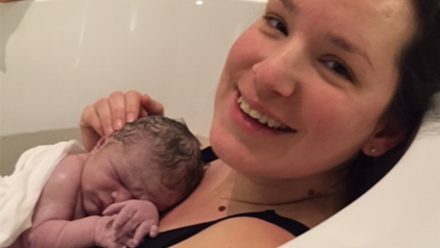 There are some practical matters to consider when choosing what kind of tub or pool to use, says Jasmin Tecson, a registered midwife with Sages-Femmes Rouge Valley Midwives in Toronto. ?Ideally, there should be space for at least two midwives to be in the bathroom, near the tub. Corner tubs work well. Shower-tubs aren?t ideal, but we?ve made them work,? she says. ?I?ve always been able to see without getting in at the end of the tub.? Tecson says you don?t have to do anything special to sterilize the tub, though most of her clients do a thorough cleaning before their due date. ?Vaginal birth is never truly sterile under any circumstances,? she explains.